Has anyone ever tasted plums? Uhmm, it looks like the majority or most Indonesians have never tasted it, maybe even just seen it before. Naturally, because this fruit is classified as imported fruit and you could say its existence is still rare in our country. Well, so that many are interested in cultivating it in Indonesia, let's try to discuss the benefits of this plum. Who knows, in the future this fruit will no longer be a rare commodity. Nutritional Value and Plum Fruit Content The fruit that is widely cultivated in China contains so many compounds that are very very beneficial for health. Like antioxidants which of course can be a weapon against free radicals, iron to prevent anemia, and sorbitol and isatin which can help overcome the problem of constipation. For those who are on a diet or want to maintain an ideal body weight, this fruit must enter your healthy diet list. Why? because plums are low in calories (46 calories per 100 g) and do not contain saturated fat. Strongly support your healthy diet right? Learn more about: Benefits of plums that are rich in benefits What are the benefits of plums? So many benefits of plums, including as an antioxidant, help overcome obesity and its complications, fight diabetes, maintain healthy bones, heart and much more. Learn more, let's discuss them one by one. 1. As an Antioxidant Plums have the ability as antioxidants. Don't be surprised, because plums are rich in vitamin C and phytonutrients such as lutein, cryptoxanthin, zeaxanthin, neochlorogenic and chlorogenic acid. The presence of these substances is able to make fruit that has a variety of colors as an effective antioxidant to prevent damage to body cells due to free radicals, including free radicals from the body such as oxygen radicals or superoxide anion radicals. Coupled with the presence of phenol in it, it further shows the ability of this fruit as a source of antioxidants that can be a weapon against free radicals. 2. Help Overcome Obesity Well, for those of you who have excess weight or obesity, try adding plums to your diet. Not without reason, according to research conducted by the University of Liverpool, plums are proven to help you lose weight. Amazingly, this fruit is able to provide anti-obesity and anti-inflammatory effects on different body cells, including fat cells. In fact, it helps avoid obesity-related complications, such as diabetes and cardiovascular disease thanks to the content of flavonoids and phenolics such as anthocyanins, chlorogenic acids, quercetin and catechins contained therein. It's amazing! 3. Helps Fight Diabetes Wow !!! It turns out that the fruit that has a sweet taste of this acid is also able to provide anti-hyperglycemic effects and is effective in helping fight diabetes. The benefits of this one plum fruit is not just a figment, because the flavonoid content in it can provide a protective effect against insulin resistance and help increase insulin sensitivity in the body. In addition, a study has also proven its ability to help lower blood sugar and triglyceride levels in the body. So, for those of you who suffer from diabetes, what are you waiting for? Feel the benefits of this one plum fruit! 4. Helps Maintain Bone Health Reportedly, plums also have benefits that are very very good for bone health. Is that right? Hem, it turns out this news is true, the results have been proven in a study which states that with regular consumption of dried plums can help reduce bone mass recovery due to aging. The content of flavonoids such as caffeic acid and routine in the plum is the mastermind behind the benefits of this one. Flavonoids such as caffeic acid and routine contained in plums can inhibit damage to bone tissue and prevent diseases such as osteoporosis. Not to mention, the presence of polyphenols and potassium in them that can encourage bone formation, increase bone density and prevent bone loss, especially in postmenopausal women who experience a decrease in estrogen hormones with age. 5. Good for the Digestive System The benefits of plums can also be felt for those of you who have problems with the digestive system. Why? Because plums are a good source of dietary fiber, especially thanks to the content of sorbitol and isatin in them. Even its benefits in treating digestive disorders such as constipation or constipation are allegedly more effective than eating husks from psyllium seeds. Again, this is all thanks to the content of sorbitol and isatin in the plum which has a laxative effect and can promote fluid secretion in the intestine so that it can increase waste rinsing more efficiently through the large intestine. Frequently experiencing indigestion? There is nothing wrong not to try this one. 6. Helps Maintain Cognitive Functions Worry about decreasing cognitive function as you get older? From now on, try to start eating plums. The content of phytonutrients such as flavonoids contained in it turns out to have more benefits to human cognitive function. These compounds are able to prevent neurological disorders such as Alzheimer's and Parkinson's disease and help optimize memory function and learning. 7. Helps Smooth Functions of the Nervous System Plums contain vitamin B-6 which is very important for the central nervous system, among others, to help the delivery process of nerve signals, help in normal growth of the brain and help the formation of hormones that will affect a person's mood or mood. In addition, the content of tryptophan in plums also helps produce serotonin which is closely related to quality of sleep, appetite and better concentration. 8. Good for the heart It turns out that the fruit that has an attractive appearance has a positive impact on heart health. Based on research, regular intake of dry plums can help promote the fluidity of blood in the arteries so that it reduces the risk of various heart disorders such as atherosclerosis and even heart attacks and strokes. Plums also contain mineral potassium which is able to keep the heart rate and blood pressure stable. 9. Strengthening the Body Immune System The content of vitamin C in the plum is quite high, it is not surprising that this fruit can be used as an alternative source to help strengthen the body's immune system from various threats of infection or disease. In addition, the content of immunostimulatory elements in plums is also proven to encourage the production of nitric oxide in the body so that it can help inhibit tumor cell metastasis and prevent various types of diseases. In order for the body to always be in a fit and prime condition, it seems we have to start hunting for this one instead. 10. Helps Control Cholesterol Levels Maybe some of the Mediskus loyal readers have high cholesterol levels? Come on, start consuming this fruit regularly. According to a comparative study, plums are very useful in controlling cholesterol levels to remain stable. In fact, the efficacy in this case is better than red wine. The fiber content in it also adds a protective effect on the heart by reducing levels of bad cholesterol (LDL) and helps increase levels of good cholesterol (HDL). 11. As a Natural Medicine Anemia Having anemia due to iron deficiency? Calm down, just use this one. Plums contain iron and copper which are important in helping the formation of red blood cells and facilitating blood purification and healthy circulation. Copper contained in plums is also capable of acting as an antioxidant and is very important for nerve health and helps the formation of collagen. 12. Helps Overcome Anxiety Perhaps many do not know, that by eating plums regularly can help overcome anxiety disorders. Based on the research, it turns out that the benefits of plums are thanks to the anxiolytic effect and antioxidant properties of chlorogenic acid in plums which have been shown to overcome anxiety disorders caused by oxidative stress. Are you stressed or confused? Try this one. 13. As a Natural Flu Drug Besides being able to fight free radicals, it turns out that plums can also fight influenza viruses that are the cause of flu. Not just nonsense, this one benefit has been proven and the results show that the concentration of plums contains lectin-like molecules that help in inhibiting and treating infections or diseases caused by influenza viruses. For those of you who are having a cold, try reducing the symptoms by eating plums. 14. Mineral Resources and Vitamins Good for Pregnant Women Pregnant women certainly need more vitamins and minerals during pregnancy. Well, plums with various vitamins and minerals contained in them can of course be the answer to this need. The content of flavonoids, vitamin C, vitamin B6, iron, sorbitol, isatin, high fiber and various other compounds is not enough to make this fruit a good natural source for pregnant women? 15. Helps Fight Cancer Cells Plum extracts have been shown to be beneficial in the treatment of cancer. 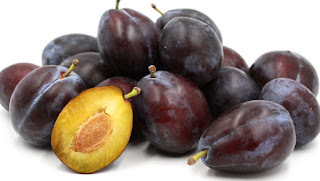 Plum fruit contains epicatechin (epikatekin) which is one type of flavonoids and has been proven to help inhibit the growth and proliferation of malignant cancer cells and induce apoptosis in hepatocellular carcinoma or liver cancer. Plums are also rich in antioxidants and phytonutrients which include chlorogenic acids and neo-chlorogenic acids which have a healing effect against breast cancer cells, without endangering healthy cells. 16. Helps Maintain Balance of Body-Acid Bases Plums contain abundant potassium, as we know potassium is an electrolyte which is very important for nerve and muscle function. Therefore, consuming potassium-rich plums is certainly very influential in helping to regulate muscle contraction and regulate the body's acid-base balance. 17. Skin Care For women who want to always look beautiful and attractive, know the benefits of this one plum fruit! You will definitely be immediately interested in taking it immediately. Plums that are rich in vitamin C along with other antioxidants are very very beneficial to maintain healthy skin and make skin glow. Not enough to get there, this fruit also contains anti-aging nutrients which of course will make your skin always look youthful and at the same time help reduce black spots and wrinkles on the face. The extract has been processed into a variety of beauty and skin care products, such as facial wash and facial masks. So what are you waiting for ladies, immediately consume plums regularly to always look beautiful and charming even without make-up! 18. Helps Prevent Macular Degeneration When talking about eye health it must be identical to carrots. But who would have thought, it turns out the plum is also no less great than carrots in terms of maintaining eye health you know. What is the reason? because plums also contain vitamin A and beta-carotene which is certainly very useful in maintaining eye health and preventing age-related macular degeneration. Coupled with the presence of carotenoid compounds (lutein and zeaxanthin) in plums which are very useful to protect the macular retina from oxidative damage due to ultraviolet (UV) radiation. 19. Helping the Blood Clotting Process Plums also contain vitamin K which plays an important role in the process of blood clotting. A small example is when your finger is injured by a knife incision, of course the blood will flow instead. Well, this is where vitamin K will work to speed up the blood clotting process so that blood does not continue to flow. In addition, vitamin K also plays an important role in maintaining bone health and preventing it from becoming thinner. Yes, even though the body does not need too much vitamin K, but if someone gets vitamin K deficiency, then they can experience excessive bleeding and various other health risks. Therefore, sufficient vitamin K needs in the body by consuming a variety of healthy food sources, such as plums. 20. Culinary Usage Because of the pleasant taste and aroma, not infrequently many also apply this fruit to processed food or cooking. Besides being enjoyed in fresh form, this fruit can also be processed into jams, sauces, sweets, pudding mixtures and so on. Even in Japan the plum bath is used as an alcoholic beverage known as 'umeshu'. After a deeper examination, it turns out that there are so many benefits of this plum. Unfortunately, its existence in Indonesia, which is still considered rare, is an obstacle for us to be able to enjoy it regularly. Even if there is, don't be surprised if the price is quite expensive. However, seeing the benefits that are so great for health, it seems that prices are not a problem, right?